Mort Kunstler Hand Signed and Numbered Judge Advocate General Edition AP Print:"General Orders No. 100"
Size: Paper - Image Size: 18" x 28" Overall Size: 23" x 32". Select additional Canvas Sizes from Drop Down Box above. Edition: Artist Proof on Paper, Signed and Numbered, Limited Edition with COA to 200 editions. Canvas Limited to 390 total. Medium: AP Limited Edition Print on Paper and Canvas Giclee Editions. "Let your military measures be strong enough to repel the invader and keep the peace, and not so strong as to unnecessarily harass and persecute the people." This message came one month after Lincoln had established the Lieber Code, which was the first formal codification of behavior for the Army of the United States of America. This directive, formally titled Instructions for the Government of Armies of the United States in the Field, General Order No. 100, outlined the Federal army code of conduct during war, as well as the institution of Martial Law. It would later become the basis for all international treaties, including the Hague Conventions in 1907and the Geneva Accords of 1954. Named for the German-American philosopher Francis Lieber, a highly esteemed professor at Columbia University who had been commissioned by the president, the Lieber Code presented policies for four major aspects of war: martial law, military jurisdiction, punishment of spies/deserters and the treatment of prisoners of war. Lieber spent over a year working on the procedure while researching military procedures of the past, analyzing the current wartime climate and conferring with an array of experts, including soldiers and politicians. Lincoln was pleased with Lieber's proposal, and considered an official code of conduct to be an absolute necessity to maintain order and a sense of decency among the ranks. On April 24, 1863, the Lieber Code was formally issued. For this historic occasion, Lincoln gathered together pertinent members of his cabinet and the military, including Brigadier General Joseph Holt, the Judge Advocate General of the Army. This forever changed not only how the American military behaved, but how militaries around the world would behave for generations to come. In September of 2010, I received an inquiry from the President of the Judge Advocate General's Legal Center and School Alumni Association (LCS Alumni Association) asking if I would be interested in a commission to paint Abraham Lincoln signing the Lieber Code. I replied that I was not familiar with the document, and was told that I was not the only one who had never heard of the Lieber Code. Virtually no one else had either. There are practically no facts about the meetings that led to the signing of the Lieber Code. These were the exact reasons why the LCS Alumni Association wanted me to paint the picture. In their mind, it would help make the general public aware of one of the most important and influential general orders ever given. I eagerly accepted the challenge. In 1987, I painted a picture of the signing of the Emancipation Proclamation. I used artist Francis Bicknell Carpenter's notes and sketches as a reference source. As a result, I already knew a great deal about Lincoln's office, the room in which General Orders 100 took place. William Bushong, the historian for the White House Historical Association, was very helpful and provided me with additional information. 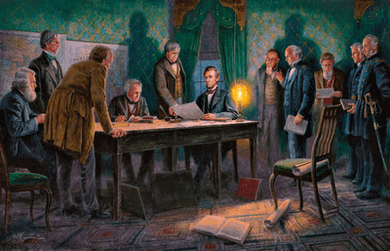 Carpenter created a painting of Lincoln and his cabinet entitled First Reading of the Emancipation Proclamation. In order to execute this piece, the artist resided in the White House for nearly six months and was given access to Lincoln's cabinet and his office. During that time the president and the entire cabinet posed for Carpenter in his office. Today, that room is known as the Lincoln Bedroom. One of my biggest challenges was that although photographs exist of the men I wanted to paint, none of them were taken with the head angles or in the lighting that I wanted. Another challenge was making Lincoln's office look authentic. The painting and sketches by Carpenter showed clearly that the president's office was a very busy place, with books leaning against the table legs. Maps were viewed and placed on chairs, books were left open and put on the floor to mark their places. All of the wallpaper, the chairs, the carpeting, the rug and the color scheme are based upon his descriptions. By staging the meeting to take place at night, I was able to dramatize various elements by using a single light source. We do know there was gaslight in that office. The man standing and pointing to the paper next to Lincoln is Joseph Holt, the Judge Advocate General, and essentially Lincoln's lawyer. Francis Lieber is seated at the table with the president, with a pencil and paper in his hand - the only one taking notes. I also have Gideon Welles, one of the oldest men in the room, seated. This gave me an opportunity to create characters in varying poses and shapes, and have all eyes on Lincoln, General Orders 100, and the Judge Advocate General Joseph Holt. Gideon Welles, Secretary of the Navy, seated at the far left, certainly had to be present to approve of any actions regarding the Codes of War. To the right of Welles, is William H. Seward, Secretary of State, who actually ordered the creation of a board "to propose amendments or changes in the rules and articles of war and a code of regulations for the government of armies in the field as authorized by the laws and usages of war." Standing and leaning with his hand on the table showing a bit of a profile, is Salmon P. Chase, Secretary of the Treasury. Undoubtedly, the president would have wanted to know how much all of this was going to cost the government. Moving to the right of "Honest Abe" and past the lamp, is Edwin Stanton, Secretary of War, one of the most powerful men in the government at the time. To the right is General Ethan Allen Hitchcock. Hitchcock was appointed to head the commission to draft the rules that ultimately became known as the Lieber Code. The chairman would have been there and in full uniform. Further to the right in the background is Edward Bates, Attorney General and the top legal officer in the government. To the far right, in full dress uniforms, are Brigadier General Lorenzo Thomas(holding the book), Adjutant General and chief aide, and Major General Henry Halleck, General in Chief of the Army. Major General Halleck is the officer who first identified Professor Lieber as an International Law expert who should be consulted when considering the creation of a codified set of rules for warfare. Now that the painting is completed, I feel very pleased with meeting this challenge. Through meticulous research and with a little artistic license, I believe I was able to take a little-known moment in American history and bring it to light in both an accurate and interesting manner. I hope you agree. No thank you, I just want the unframed AP print.